As a company with close ties to the Sunshine Coast community, Quik Corp recognizes the importance of Wishlist’s charitable work in the close-knit community and are extremely proud to have partnered with them to support their efforts, by giving back to local Sunshine Coast families. 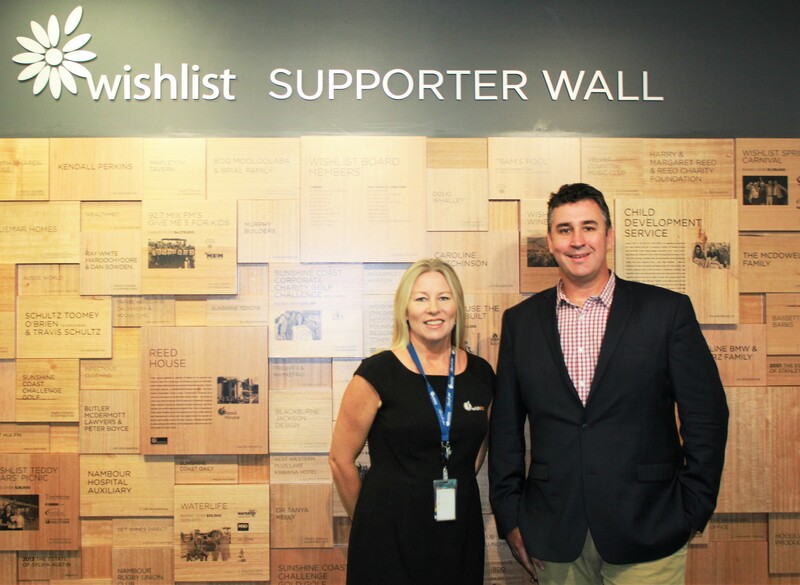 The Wishlist Foundation exists to harness the support of local businesses—like Quik Corp—to enhance the work of the Sunshine Coast Hospital and Health Service for the benefit of local families that are visiting the hospital, working to keep families together at critical times of need and offering funding for research and vital medical equipment. Here are some of the projects they have funded. Quik Corp Managing Director, David Wardle, said the company wanted to support something in the local area that they felt made a significant difference to people’s everyday lives. “After visiting the hospital and seeing what was being done to help, it was an easy choice for us. Our staff can appreciate what it feels like to have a family member or friend ill. It is never a good time. So, to actively contribute to improving facilities and accommodation to help those who are doing it tough, was supported by the whole business as the best way to give back to our community,” Mr Wardle said. Since 1998, Wishlist with the help of a generous and committed community has raised and directed more than $18 million towards the Coast's local health system. Wishlist’s Lisa Rowe said the partnerships are crucial to the foundation and its fundraising efforts. “In the case of Quik Corp, our charity is proud to be partnered with a cutting edge, locally-based business leader, achieving incredible things in the world marketplace. As with all our partners, Quik Corp share a passion for the Coast community which is a win for Wishlist and potentially every Sunshine Coast family who visit a local hospital or health service. “We are incredibly excited to be working with the Quik Corp team,” Ms Rowe said. When purchasing a fire appliance, it's common to assume that your vehicle is dedicated soley to that function. At Quik Corp, we make the best use of your vehicle by offering slip-on systems that can be easily moved on and off your vehicle when not required. This means the vehicle can be utilised for duties other than firefighting. The fire module can be reused when the vehicles life is over. For further information on this slip-on design, please contact our office on 1800 645 688. 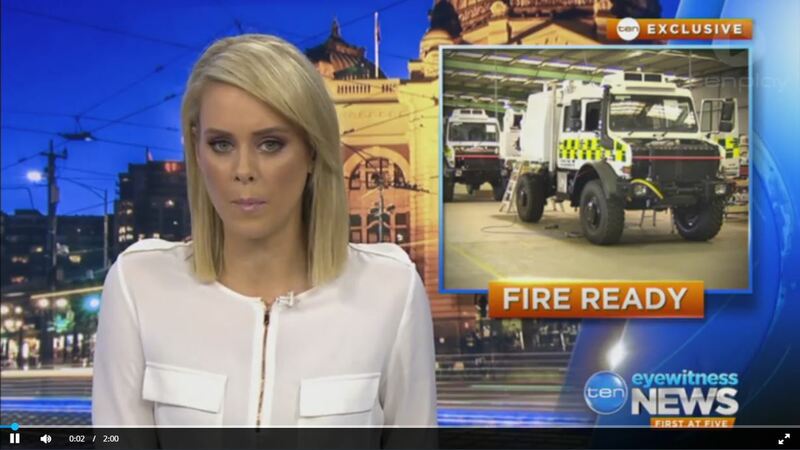 Quik Corp Fire Engineering are pleased to release our latest Incident Command Trailer. 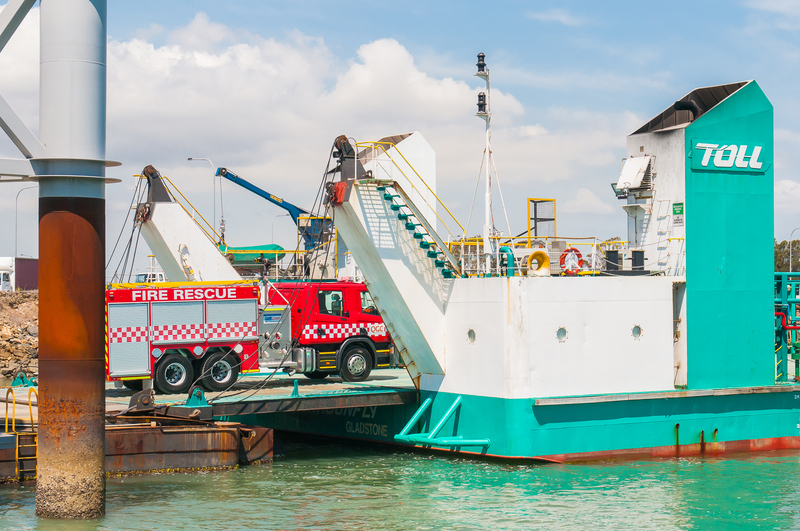 The practical, mobile solution for the command and control of emergency situations comes fitted with an extensive communications hub and everything you need for a mobile emergency control centre. We’ve packed in literally everything - including the kitchen sink! The impressive swing-out kitchen is complete with ample bench space, microwave and camp stove. The external working LED lights are strategically placed on top of the canopy to light the surrounding areas at night, and a completely lit internal working environment ensures you can work long into the night. The pull-out awnings extend the usable space around the trailer, providing valuable shelter to staff. The on-board generator ensures you have power no matter where you go, even in the most isolated areas. The heavy duty construction of the trailer makes it perfect for off-road conditions, complete with extra-long draw bar to make it easier to manoeuvre when reversing. 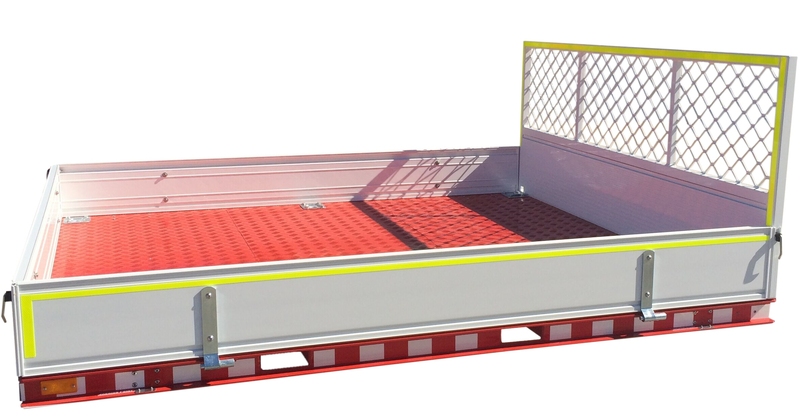 The street-side and kerb-side legs provide that extra support when the trailer is erected as a command centre. Quik Corp offer the most advanced command centre trailers that are ideal for coordinating emergency rescues and special events. For a completely towable option that is easy to set up and pack down, even in the most isolated locations, call Quik Corp to discuss your specific requirements on 1800 645 688. 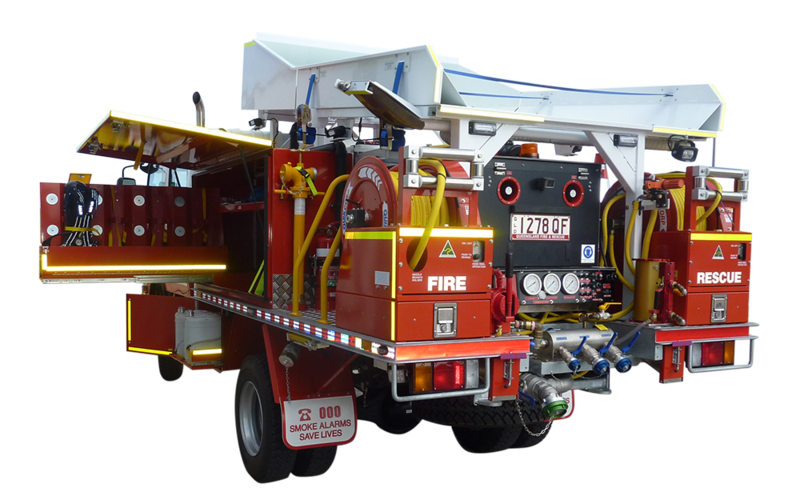 The latest heavy fire appliance by the team at Quik Corp Fire Engineering has been released. The 3000 litre Isuzu fire appliance features a Turbo Charged Isuzu 4 stroke diesel engine which accommodates six personnel. The truck left Quik Corp headquarters today, destined for the Northern Territory. Packed with enhanced safety systems, the vehicle has been custom fitted with a ROPS system to protect vehicle occupants in the event of a roll-over. The custom-built back comes jam packed with features and has been constructed specifically to suit firefighting roles. Bringing you the latest in firefighting innovation, the truck comes complete with warning systems inside the cab, a vehicle deluge system for added protection in the event of a burn over, extensive ergonomically safe stowage options, overhead stowed extension ladder, and emergency and working lights to illuminate the area around the vehicle. 28 years’ experience in the emergency services and agricultural industries has equipped our team with the knowledge and expertise to create a product with the best functional features for you in the field. 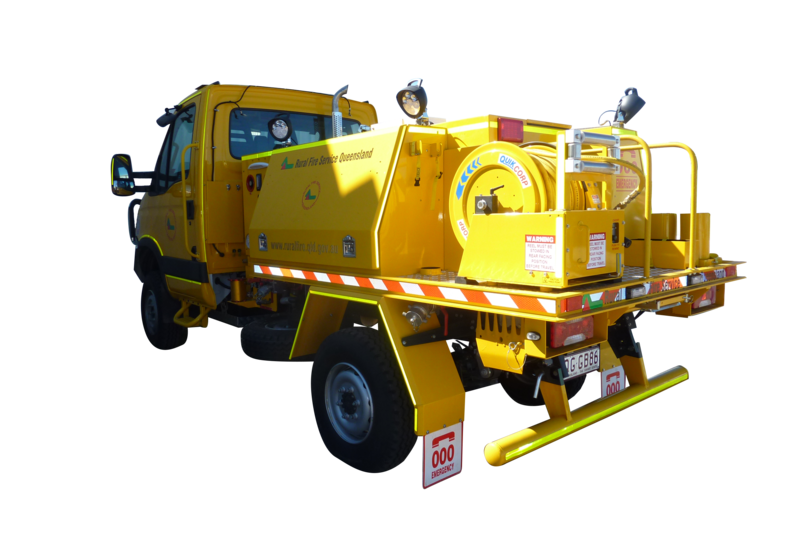 For further information on this vehicle design, please contact Andrew Geue at Quik Corp Fire Engineering on 1800 645 688. 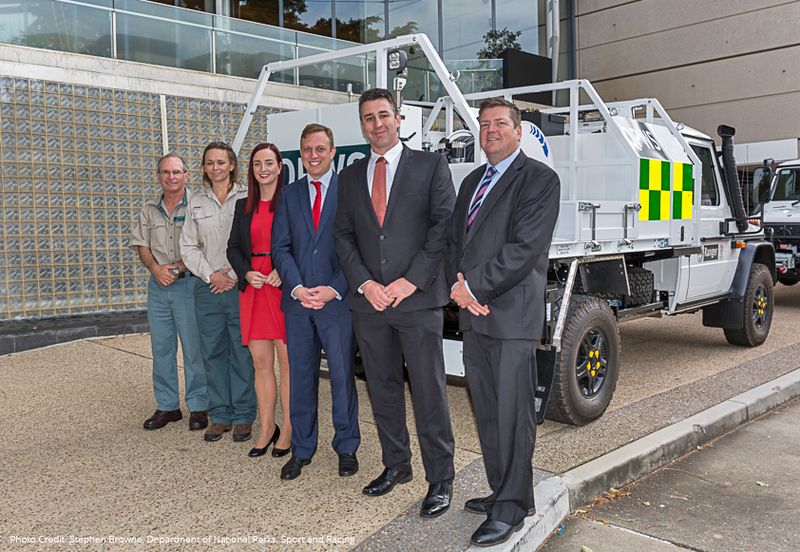 Quik Corp Fire Engineering are proud to release the first of three Ultra-Light fire appliances to ACT Parks and Conservation in Canberra. Quik Corp Fire Manager Andrew Geue made a special trip to officially hand over of the new purpose-built firefighting vehicle just in time for fire season. Designed specifically for the requirements of Parks rangers, the firefighting vehicle incorporates a FOPS (Falling Object Protection Structure) to protect vehicle occupants from falling trees and debris. The outer working area has a strategic lighting system to light the area around the vehicle at night or in smoky conditions and comes equipped with two reversing cameras for easy navigation. Custom made lockers with stowage brackets ensure that tools and equipment are stowed away safely. The Mercedes Benz G Wagon is also proving to be a popular option as a fire vehicle due to its increased carrying capacity and off road capabilities. An evening of entertainment and charity all in the name of supporting our Aussie troops, the Defence Charity Ball was a fantastic event for Quik Corp to attend. Hosting guests from the corporate scene and Australian Defence Force, the charity ball raised funds and awareness in support of those who lost loved ones during service, and face hardship after serving in the armed forces. As a company with links to the defence force, Quik Corp recognises the importance of Legacy’s work and are fortunate to support this valuable charity. Quik Corp were thrilled to be presented with a rare authentic Australian Flag won at auction, with all proceeds going towards the Legacy fund. The work Legacy does helps to change the lives of the families of those who have served our country. Uniquely numbered and a very rare item, the flag was presented to Managing Director David Wardle at Quik Corp Headquarters today. Hand delivered by the Lieutenant Colonel Stephen Jenkins himself who is on leave from Afghanistan, the LTCOL personally held on to the flag as they flew over Qargha coalition base in Afghanistan. Complete with a full-sized flag folded into a timber presentation case, memorabilia coins and certification of authenticity, the flag will hold pride of place at Quik Corp Head Office at the front entrance for all to admire. The Minister for Energy, Environment and Climate Change, Lily D'Ambrosio inspected the first of over 70 new firefighting vehicles at Quik Corp's Melbourne facility in Laverton North today. 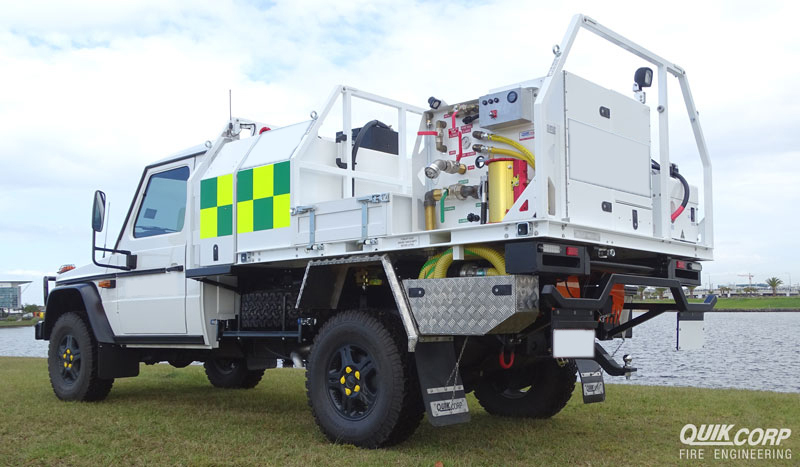 The state-of-the-art vehicles designed on a Mercedes Benz Unimog Chassis are the first of its kind for firefighting in Australia and come equipped with a FOPS (Falling Object Protection System) to protect vehicle occupants from falling trees and branches. With a water fording capacity of 800mm, incabin firefighting capability and burn-over protection system to protect occupants inside the cabin this vehicle is a class above the rest. "We're making sure that Victoria's forest firefighters are better prepared than ever for bushfires and for carrying out bushfire risk reduciton work, such as planned burning" said D'Ambrosio. 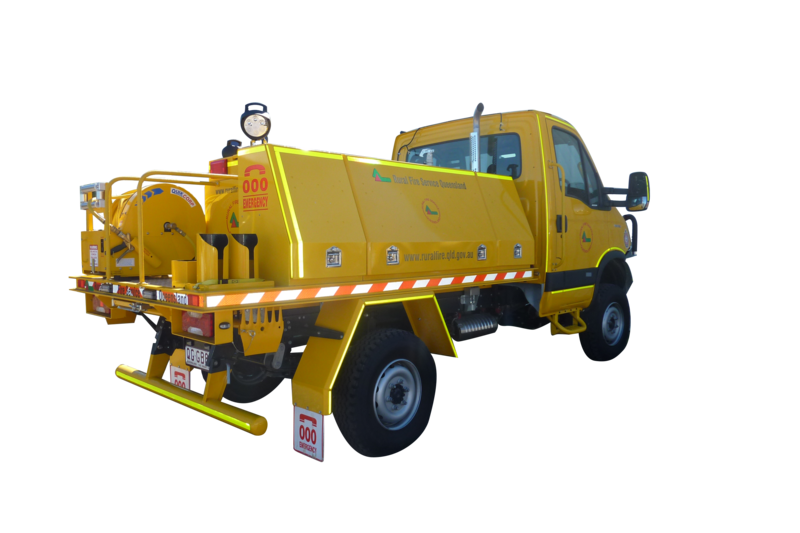 Quik Corp are proud to release a number of new firefighting vehicles which were purpose built for QPWS (Queensland Parks and Wildlife). Inspecting the new vehicles at AFAC, National Parks Minister Dr. Steven Miles said the new vehicles include a range of features to suit QPWS. 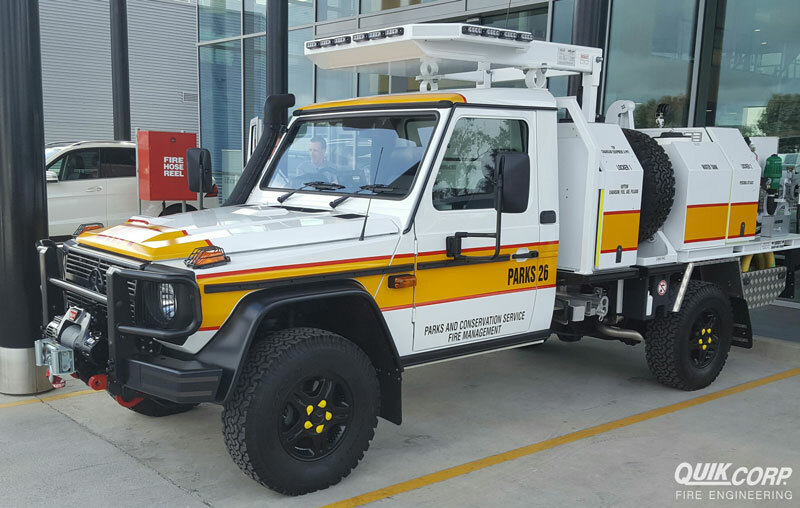 “The new G-Wagon’s have been modified by local Queensland manufacturer Quik Corp Fire Engineering to meet the needs of QPWS rangers undertaking fire management works. The modern design includes weight-carrying capacity so more water can be carried, additional storage for equipment and a protective structure to boost firefighter safety from falling trees and branches”. 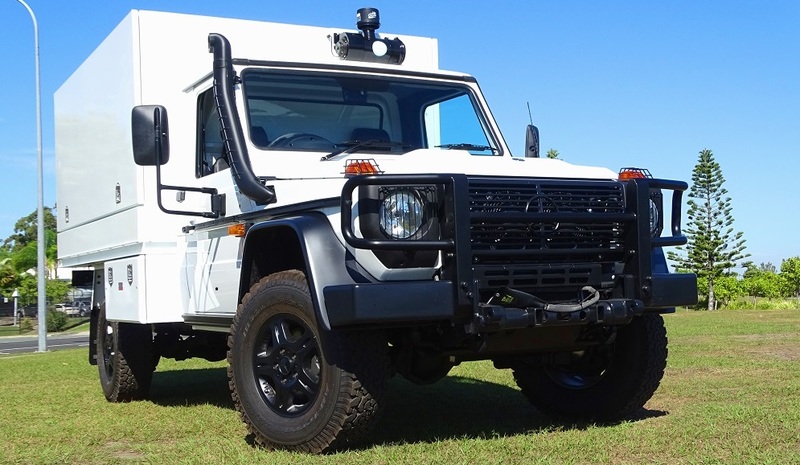 Quik Corp Managing Director David Wardle said the Quik Corp team worked closely with QPWS to fit out the Mercedes Benz G-Wagons with equipment designed for firefighting and planned burning needs. 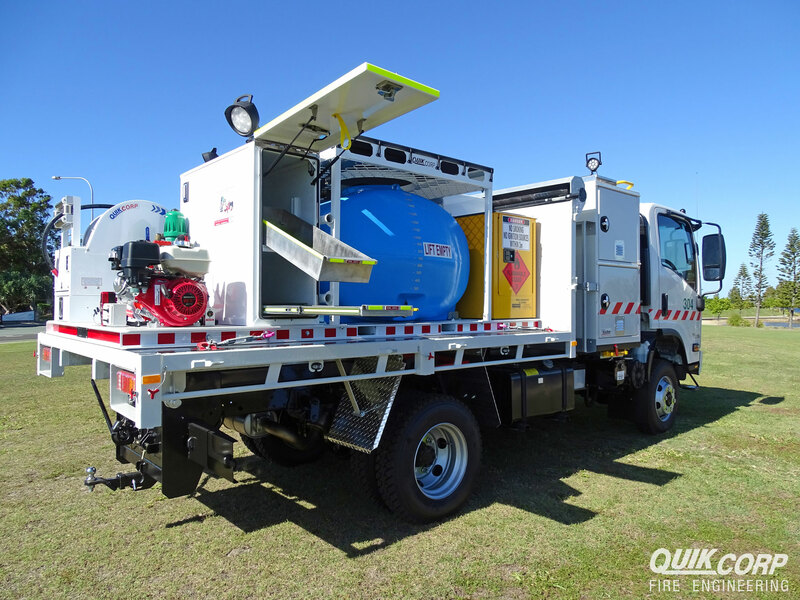 “Quik Corp has had a long standing relationship with QPWS and as partners we have a strong track record of working together to provide safe and functional equipment for the operator in the field,” Mr Wardle said. 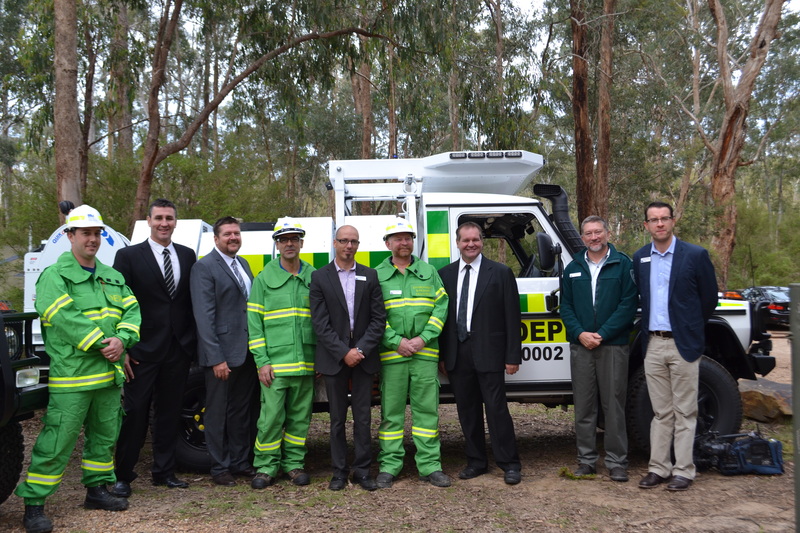 Six vehicles have been completed for Fraser Island, Kingaroy, Samford, Springbrook, Kenilworth and Byfield. 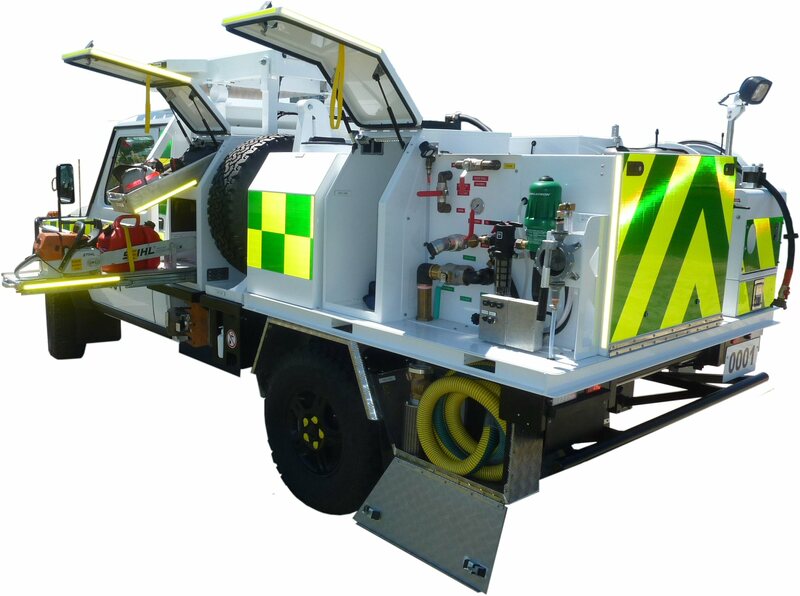 The vehicle comes complete with a customised removable firefighting platform that can be easily swapped for an all-purpose flatbed tray. With over 2500 emergency management personnel, volunteers and fire industry professionals attending this year, AFAC16 Brisbane was a hugely successful event. From exploring new approaches in disaster management to new technologies being showcased, Quik Corp was pleased to be a Gold Member exhibitor at this year’s exciting event. 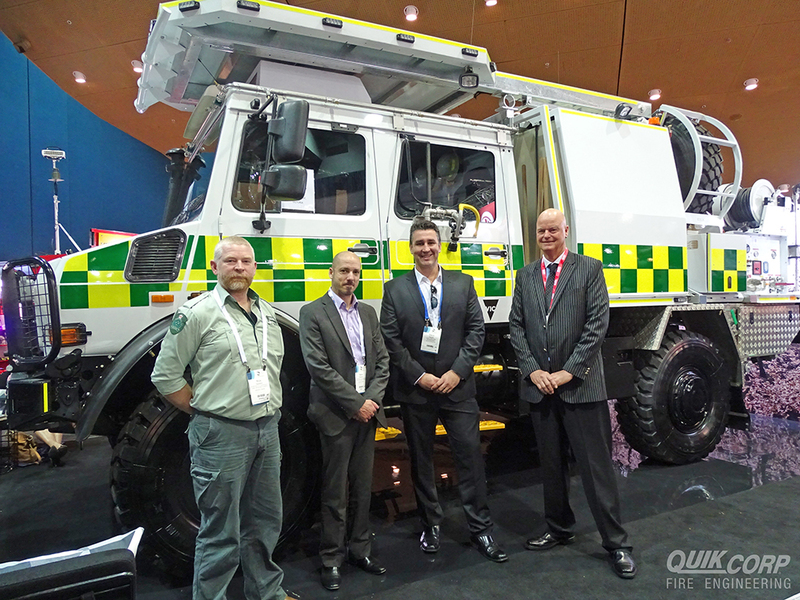 Quik Corp Fire Engineering had a number of vehicles on display at the exhibition. Amongst these was the recently completed Unimog Tanker prototype which was a big hit with everyone who looked at it. It was also an opportunity for those attending the conference from around Australia to witness the Victorian purpose-built Light Attack G-Wagon in action after DELWP were called upon to extinguish a simulated fire in the public demonstration area. From fire demonstrations to photo opportunities, Managing Director David Wardle was blown away by the phenomenal amount of interest at AFAC16. “AFAC is always a great time to reconnect with existing customers and also to meet new ones. I couldn’t be happier with the feedback we received during this event." Quik Corp Fire Engineering are pleased to unveil the newest addition to their expansive range of firefighting equipment. The QCFE heavy duty fire trailer coupled with a carrying capacity of 1000L and optional foam systems is your key partner on the fire ground. Designed to perform in tough off-road terrain, the trailer has a reinforced chassis and low centre of gravity for added safety for when the tank is full. From farming to firefighting, innovative agriculture and emergency service equipment manufacturer Quik Corp has been awarded the 2016 Telstra medium business of the year and Telstra Queensland Business of the Year. After a stellar year for the company, including expansion into the Victorian market on the back of winning a large government contract, Quik Corp is now a promising contender for the Telstra Australian Business of the year to be held in August. Quik Corp specialises in highly customisable innovative equipment and is considered the industry leader for many projects and turnkey solutions. The company has also recently released the greenPRO range of innovative farm implements to service the rapidly growing small farm and lifestyle market. Managing Director David Wardle said Quik Corp was defying the odds of the Australian manufacturing industry by focusing its efforts on innovation and excellent client service. “As an Australian manufacturer, we are very aware that to remain viable, we must innovate and manufacture quality Australian-made products” he said. After securing some longer term contracts and a boost in sales from existing and emerging markets, Quik Corp have recently expanded their facilities both locally and interstate to facilitate this exciting growth. 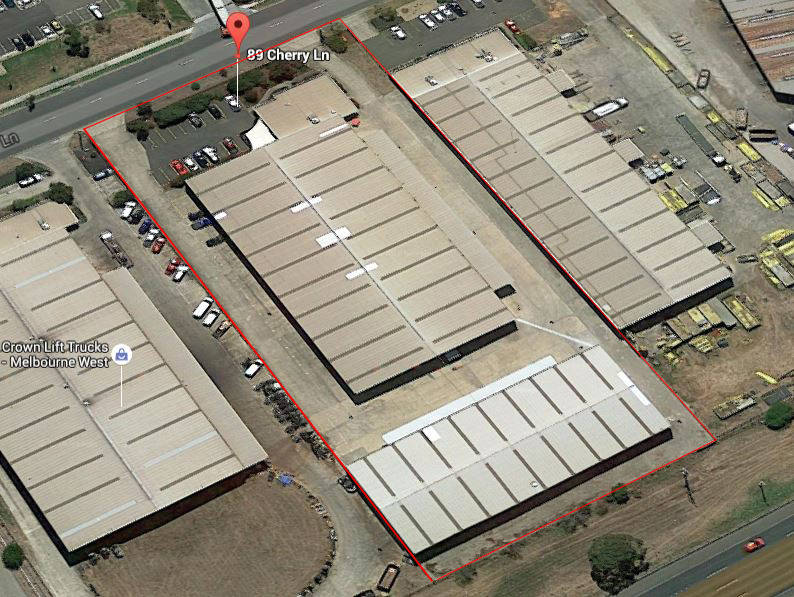 This has seen the addition of a new facility at 89 Cherry Lane, Laverton North in the western suburbs of Melbourne. This sites primary function is to output fire vehicles under a 5 year agreement with the Department of Environment, Land, Water and Planning. The site has 30+ new staff, complete with seperate fabrication, assembly, customisation line and vehicle service centre. We aim to expand on our current work to better service existing and potential customers to provide a stable presence in southern Australia. Meanwhile in Queensland, Quik Corp's Sunshine Coast site have doubled their warehouse space, expanding their fabrication and assembly lines over two substantial locations. In addition to this, we are also looking to add value to our Crows Nest location. Again the aim is to be able to best react to the market and provide the best possible products and customer service. Managing Director David Wardle believes that these expansions highlight what is an exciting time for the business. "While presenting quite a number of financial and logistical challenges to get these areas up and running, we could not be more happy with the results. Servicing our clients needs over the past 12 months had been becoming difficult in our existing premises, so this expansion has been very timely. It has led to a broad range of new opportunities and the creation of a lot of new jobs, which in the current climate is even more pleasing. We are seeing a really good return on investment from this increase in quite a short time and are very confident that these expansions will provide sustainable growth long term." Quik Corp Fire Engineering are proud to deliver a new custom fitted off-road vehicle for an award-winning outback tour company. The custom built Mercedes G-Wagen utility will travel the Australian outback in a fleet of vehicles that journey to the most scenic and remote parts of Australia. The military-spec vehicle designed for hard, rough terrain will take tourists and equipment to regions that would otherwise be inaccessible. With the focus on a hardy performance-based vehicle, the Mercedes Benz G Wagen was a no brainer. While in action, the vehicle is designed to be a supreme work-horse complete with individual storage compartments that allow the user to store and organise their extensive range of camping equipment along with the luxury of a Mercedes vehicle. Complete with custom lighting inside, the module has pressurised chambers that keep out fine particle bulldust. The intelligent vehicle technology is programmed to notify the driver if the locker doors are left open and has two under-tray lockers complete with swing-down doors and the addition of a 5.6” LCD touch screen reverse camera for easy handling. With the capacity to dominate the outback desert and withstand the heavy-load requirements, our customer was very pleased with the final outcome of the vehicle. Quik Corp are excited to contribute to a true blue Aussie experience. 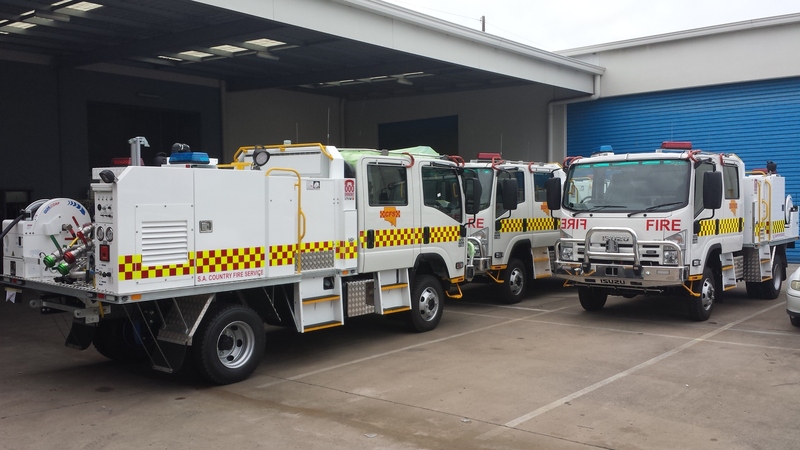 Quik Corp has recently released eight ultra-light firefighting vehicles designed specifically for the Department of Environment, Land, Water and Planning as part of a statewide upgrade of its fleet. These are among 31 being rolled out across Victoria over the next four weeks with an additional 270 to be delivered over the next four years. DELWP Chief Fire Officer Alan Goodwin said the upgrade was helping to position Victoria as the leader in firefighter vehicle safety. 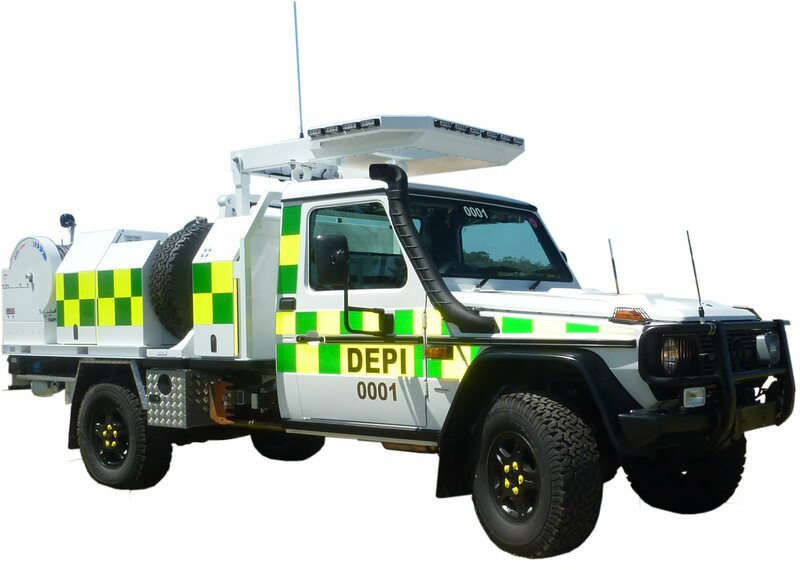 "These vehicles are modified Mercedes Benz G Wagons and have been specifically fitted out with equipment designed for DELWP's firefighting and planned burning needs," Mr Goodwin said. 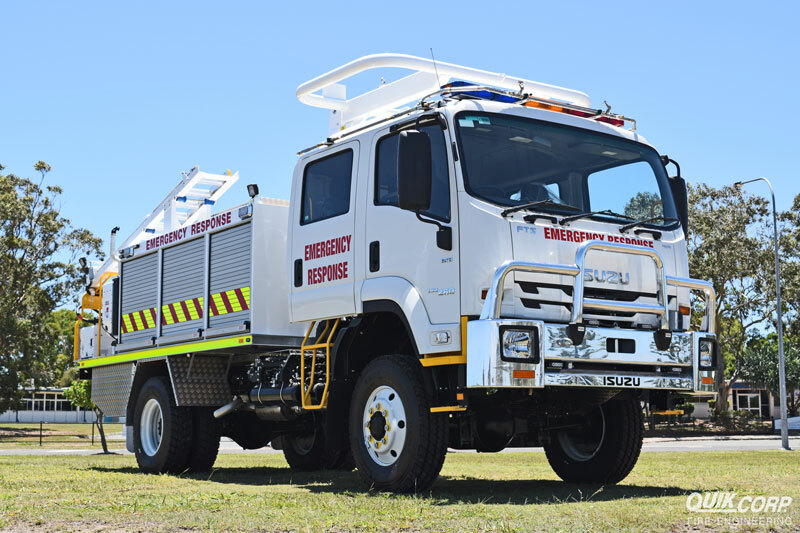 Quik Corp Fire Engineering is proud to have delivered the first Multi-Purpose Medium Attack Iveco Daily to the QLD Rural Fire Service. The first of its kind, the appliance utilises three different modules that are designed for a more-varied use of a vehicle, covering serveral roles. 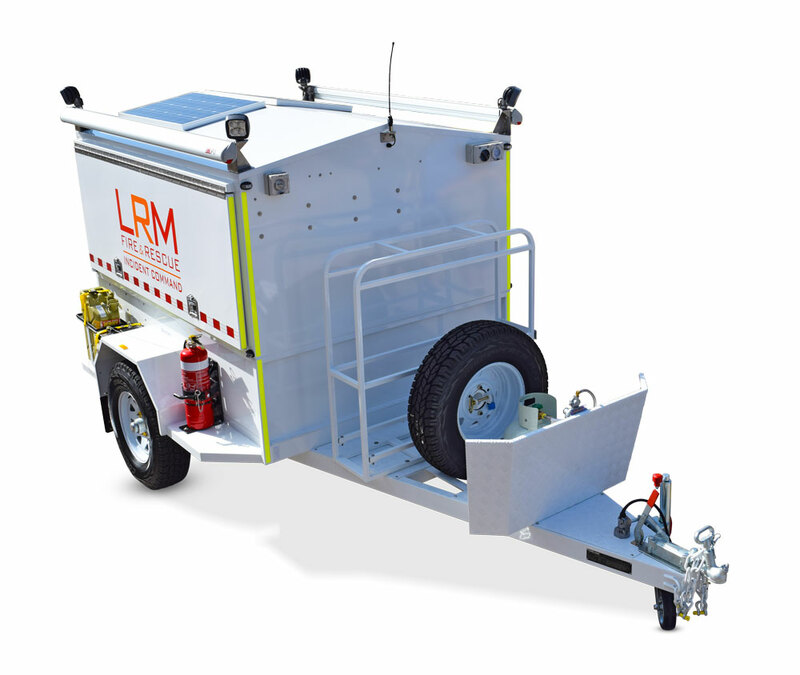 Suitable for four personnel, the appliance can deploy firefighting foam, water and rescue equipment that is suited to the suburban and semi-rural regions. When not in use, modules are stored on jacking legs and can be easily removed manually or with a forklift. The versatility of this system allows for greater and more vaierd use of a vehicle, meaning less investment in vehicles across your fleet. Completely customisable to your requirements, Quik Corp can build to your requirements. As Quik Corp continues to expand, it is a priority for us to ensure we continue to deliver high quality service and equipment. To do this you need to have the best people and it is a focus for us to expand our skill base. As such Quik Corp would like introduce the latest member in our team, Mal Assim. Mal is our new Production Manager and will oversee the Crow’s Nest branch. With vast amount of experience and qualifications, Mal comes from a strong managerial background within large and small manufacturing industries. He is a certified Boilermaker and Welding inspector, as well as having qualifications and experience in Project Management, Business Management, Mechanical Engineering, Welding Engineering, Pneumatics, and CAD. 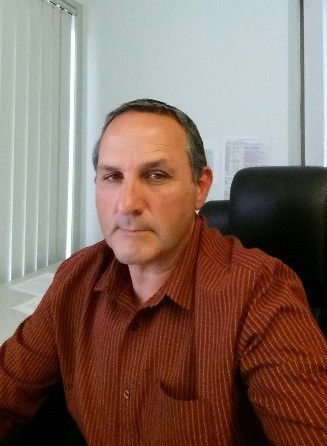 Mal has been a Production Supervisor - managing staff, projects, and machinery - for companies such as Engineering Services UGL, Davey Engineering, and heavy steel manufacturers RPG. He was Production Manager for mining company WDS where he was able to expand his management expertise and work on innovative projects. He recently spent a year in China as Senior Quality Coordinator for Sinostruct, where he was responsible for the auditing and inspections of all projects under his management. Mal is a hands on leader who works strongly with his team to bring out the best. He has a passion for delivering high quality products in a timely manner. We know that when we couple this with the already skilled and dedicated team at Crow’s Nest, there is plenty to be excited about in the future. Welcome to the team Mal! Quik Corp has recently delivered a Scania 6X4 Crew Cab-Large Urban Fire Appliance to QGC in support of the QGCLNG plant on Curtis Island in Gladstone. The unit will be under the command of specialist fire and rescue services provider Corporate Protection Australia onsite who are a valued partner. To provide scene lighting in response situations. To discharge water from a variety of discharge points include an overhead mounted water turret/monitor. 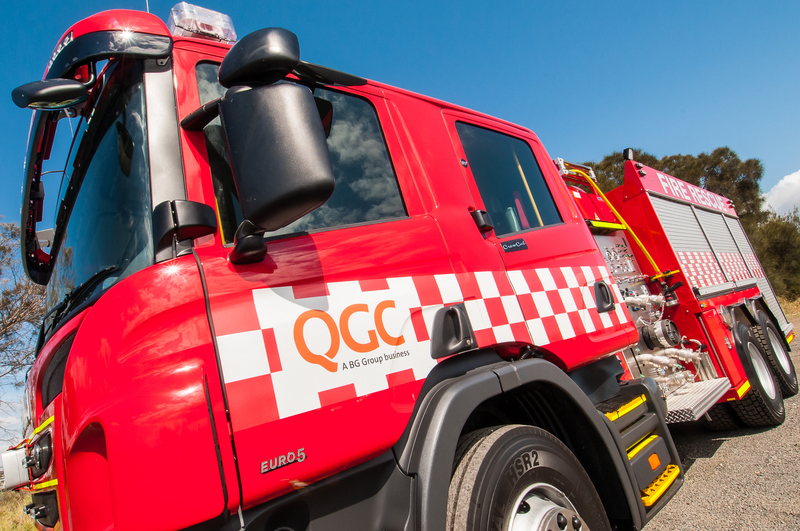 Quik Corp is proud to announce a contract to supply over 400 Ultra-light Fire Appliances with The Department of Environment and Primary Industries in Victoria. The contract is worth in excess of 20 million dollars over 5 years and features the latest in ultra-light attack appliance technology incorporating a modular and functional design. The unit can be removed if needed and also be accessorised with purpose built land care attachments for the full requirements for a forestry application. 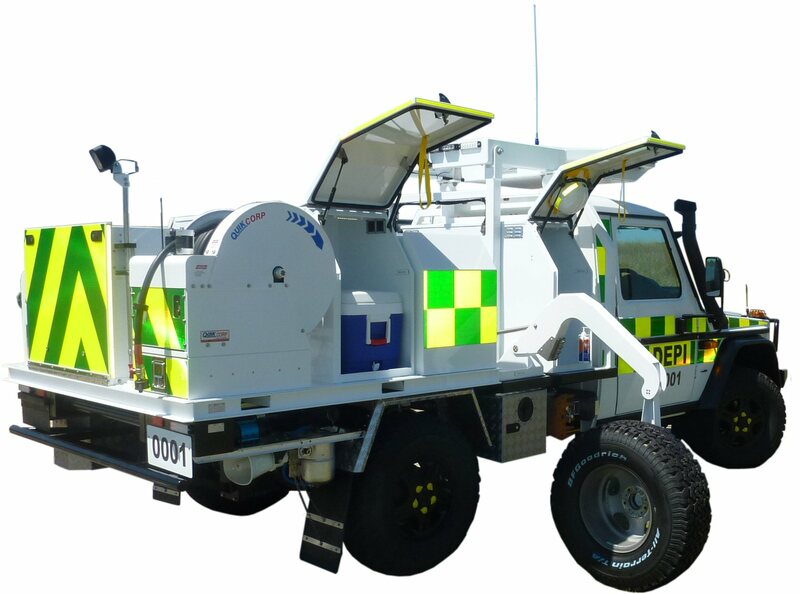 Designed to suit the Mercedes Benz G Wagon platform, it incorporates the engineering excellence of both organisations, to provide a safe and functional appliance for fighting high risk forest fires in a traditionally intolerable environment. In collaboration with The Department QCFE also designed and certified a FOPS system that will ensure maximum safety from falling trees for fire fighters in the vehicle cabin. 1. Custom built stowage and locker configurations that ensure efficiency and ease of use for the fire fighter. For more information on our range of light attack fire vehicles please contact us. 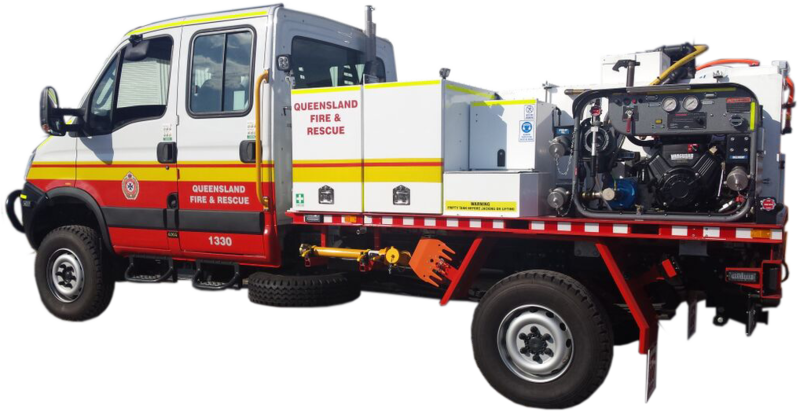 Quik Corp Fire Engineering is proud to announce the successful completion of the latest addition to the fire fighting fleet for Queensland Fire and Emergency Services. Dubbed the "Izone" it is a multi purpose fire and rescue platform mounted on a Isuzu NPS 300 Crew Cab 4 x 4. The Izone, although small in size, is packed full of equipment and fire fighting tools including SCBA sets for all crew, air compressor, 2 x QFCE powerd hose reels (RFR-2), earth tools, back burning equipment, a 1200L custom designed water tank and a fridge in the cabin for crew. The Izone also include pioneer innovations in its design, including the new QCFE multipump system, 3 sources of fire fighting foams and overhead storage for a swift water rescue raft. 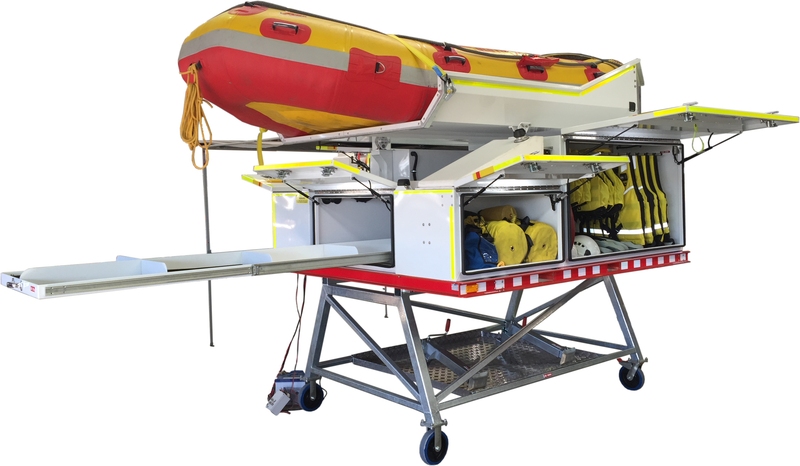 The integration of a rack to store a swift water rescue boat has had a positive reception amongst the fire fighting community with the possibility of future fire appliances incorporating the technology. The multipump system as the name implies, is a dual pump-set featuring a GAAM MK125 and a Medium Pressure (480psi) Diaphragm pump, which provides the operator the best of both worlds when it comes to water output. The Diaphragm pump delivers significant water savings by combining higher pressure with variable flow (13-50Lpm), delivered through 100m of 1/2"ID hose. Both pumps can be operated independently and are powered by a single engine. The mulitpump has proved popular in the fire fighting community with a large number being used in the field. QCFE can also provide numerous pumping and drive options. 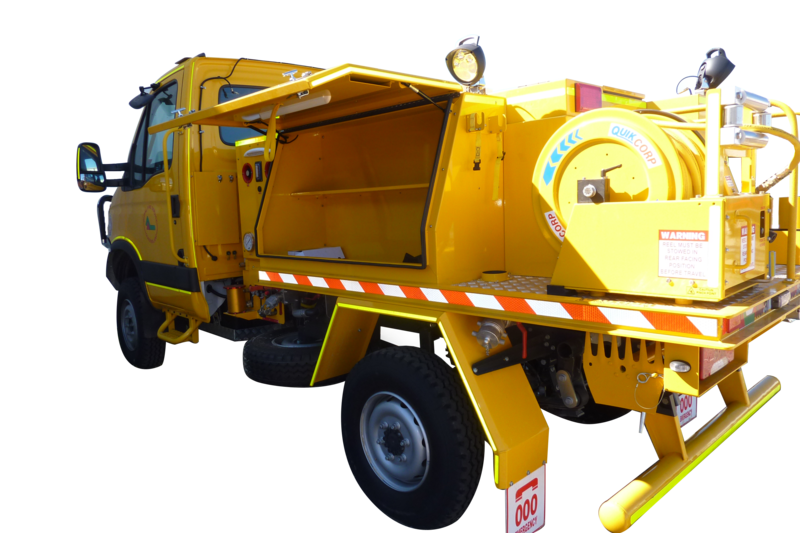 The NPS 300 is a very versatile vehicle and is available in a range of different configurations and with numerous options. Click here for more information or call 1800 645 688 to speak to a representative. QCFE roll out three of the new South Australian Country Fire Service 14 Crew Cabs ready for inspection. The remaining three units will be finished early in the new year in what has been a successful project between QCFE and CFS. Brand new CFS Meduim Tankers ready for Inspection. 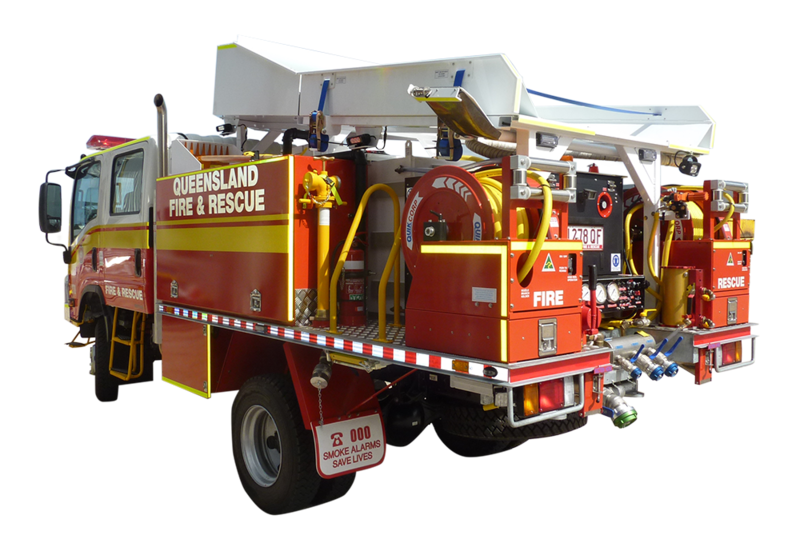 Quik Corp Fire Engineering has recently completed the manufacture of 3 prototype rural fire fighting appliances for Queensland Fire and Emergency Services (QFES). It is the first generation of the Light Attack fire fighting appliance to be produced in Australia and the first to be delivered to QFES. It is mounted on a IVECO Daily Single Cab 4 x 4. Vehicle has had a GVM derated to 4495kgs. The features a new custom designed 800L water tank, a massive 60% capacity increase to that of a Toyota Landcruiser (Fire Cruiser). The compact and lightweight tray design allows for maximum storage capacity with space available for earth tools, fuel canisters, firefighting foam and suction hoses. The Light Attack Vehicle also features a Quik Corp Powered Reel (RFR-2) on a rotating base to ensure ease of operation when in the field. The Iveco has been upgraded to feature 3 seats instead of the factory 2, in the cabin. Remarkably, despite the large amount of equipment and water stored onboard, the Iveco is still able to be driven under a regular C class licence. The Iveco is available in a range of different configurations and with numerous options. Click here for more information or call 1800 645 688 to speak to a representative. 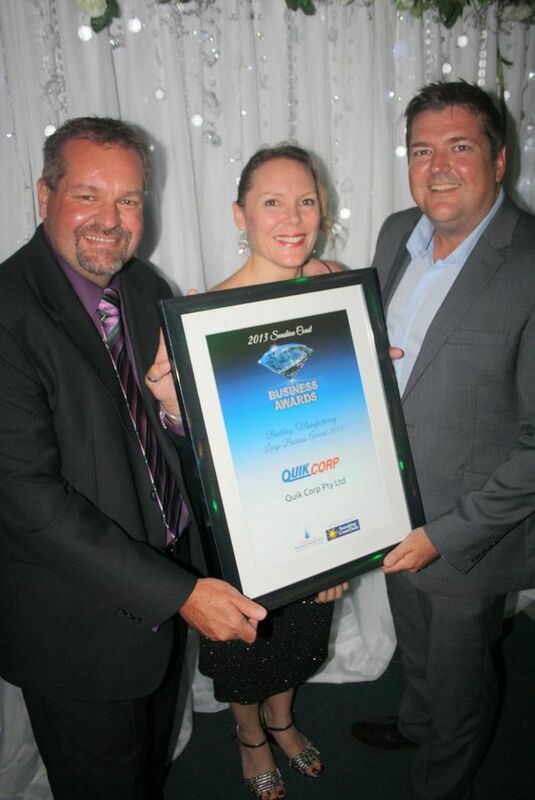 Quik Corp has been presented with the innovation award at the Sunshine Coast business awards for the worldwide patented Solid EF. (Left to Right) QCFE Fire Products Manager Andrew Geue with Quik Corp's Financial Controller Jacqueline Clarke and Business Development Manager Chris Coren (far right). Click here to learn more about this ground breaking product. 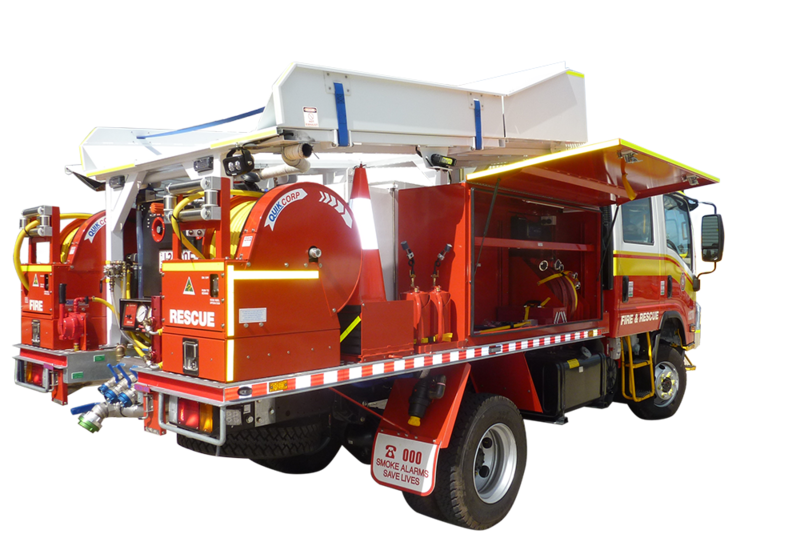 Quik Corp Fire Engineering has recently unveiled the first Hi-Ex Foam Fan Trailer for Corporate Protection Australia (CPA) Group. 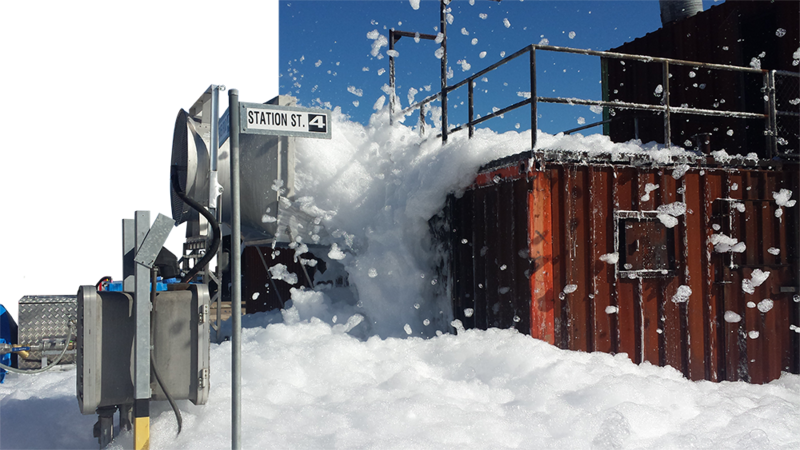 The Foam Fan Trailer is the first of its kind but is expected to become a very popular fire fighting appliance. 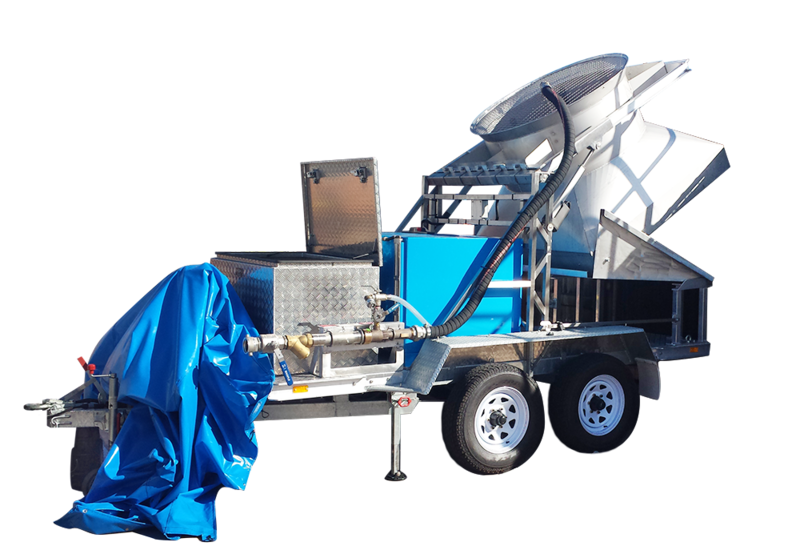 As the name implies, the Foam Fan trailer is a portable fan that is capable of producing large amounts of foam which will spread and cover a ground area to aid in suppressing gas based fires. The Foam Fan Trailer features an Ansul Jet-X20 Foam Fan which has the ability to be raised and lowered through a 90 degree range of rotation with the assistance of electric linear actuators. 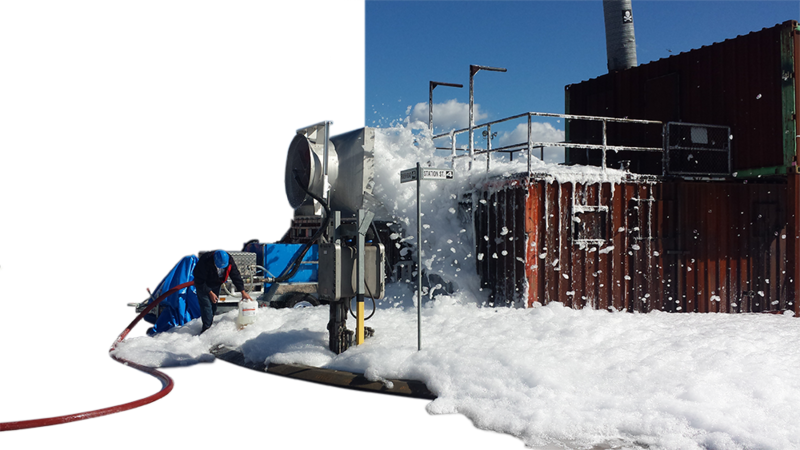 The unit has a 100L on board fire fighting foam tank along with necessary pipework to induct the foam liquid into the water stream at variable rates. All the equipment is mounted onto a ultra heavy duty QCFE dual axle trailer. The trailer recently completed a successful demonstration test for CPA and is expected to be commissioned for a Gladstone based LNG project on Curtis Island. Click here for more information on the Foam Fan Trailer or call 1800 645 688 to speak to a representative.